The news is spectacular: Jesus Cantú, a former Thriving Minds student and three-time summer intern at Big Thought, has been accepted into the prestigious Massachusetts Institute of Technology. He starts classes during the Fall 2017 semester. Jesus, 17, is a glowing example of the prospering power of exposing kids to creative learning environments. Cantú was born in Laredo and raised in Mexico until his fourth birthday when he came to Dallas. The Oak Cliff resident remembers his involvement in Big Thought’s Thriving Minds program when he was in elementary school, and later summer camps at the Oak Cliff Cultural Center and the Latino Cultural Center. It set the stage for his educational trajectory. Come May 2017 he will graduate from Dallas’ magnet campus School of Science and Engineering. 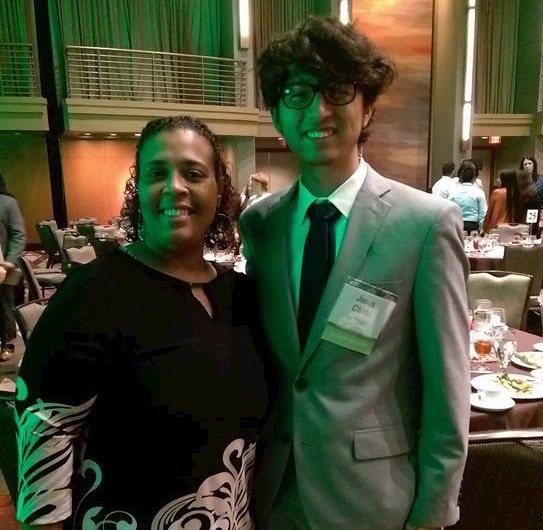 As a Big Thought summer intern in 2014, 2015 and 2016, Jesus was an instrumental force on the ground during the many community events surrounding the Dallas City of Learning initiative. In fact, he was the go-to guy for translations. A huge part of his role was translating English to Spanish – and vice versa – to keep parents and kids abreast of DCoL. That’s a huge soft skill right there. Jesus learned true empathy and resilience. He saw himself in those childhood mirrors. When it came time to craft his MIT admissions package, Jesus was one-up on the game. During his last two summers with Big Thought, Jesus was part of the Dallas Mayor’s Intern Fellows Program. Nattily attired in a professional suit, Jesus attended the Dallas Mayor’s Intern Fellows Program Luncheon, held Aug. 1, 2016 at the Hyatt Regency Dallas. MIT is lucky to have you, Jesus. Big Thought wishes you continued success. Pictured: Jesus Cantú with Erin Offord, Big Thought Senior Director, Program Implementation. Photo by Mario Tarradell/Big Thought.